I love holidays and making them extra special and festive. Valentine’s Day is high on my list as one of my favorite holidays. It is such a great holiday to make a little extra effort to show the people you love how much you care about them. 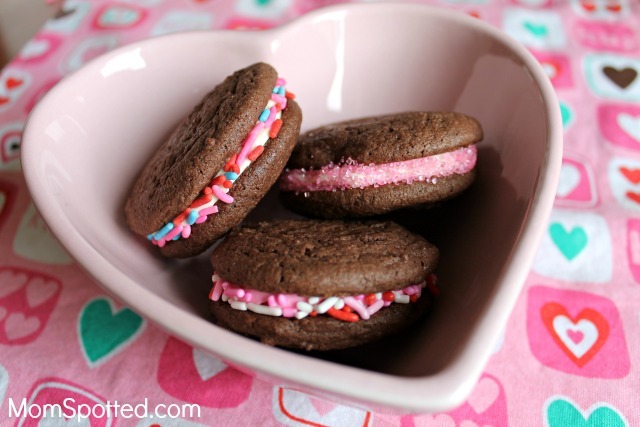 It is so fun to decorate for, and Valentine’s Day treats seem extra delicious dressed up in pink and red. Homemade Oreo Cookies are one of my family’s favorite treats. They are soft, chocolatey, yummy, and easy to make. 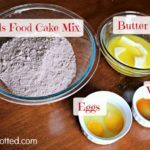 Homemade Oreos only require 4 ingredients and you could easily already have everything you need in your pantry to make them. These are such a fun and cute dessert. They come together so quick and they are always the hit of holiday parties. To start the cookies all you need is a box of devil’s food cake mix, 2 eggs, 3/4 cup of partially melted butter, and 1/2 teaspoon of vanilla. I like to throw all the ingredients into my mixer and I blend it until it is well blended. The mixture will be super thick. Then using a cookie scoop you put them onto a cookie sheet and bake. A cookie scoop just helps make sure all the cookies are the same size since you will be sandwiching them together. This time I used some leftover frosting we had from a can for the filling. But I often make my own cream cheese or buttercream frosting and these little cookies are extra yummy. I colored half of the frosting pink and left the other half white. I like to put the filling into sandwich bags, cut one corner off of a bag and pipe the frosting onto a cookie. Then I rolled the sides into cute Valentine’s day sprinkles I had. They turned out so cute and my family gobbled them up. These are so great to make all year round. I have made them at Christmas and colored the frosting green and red, or at Halloween and colored the frosting orange. 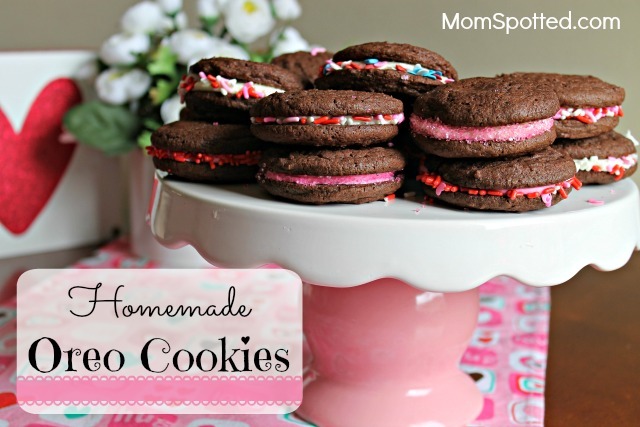 Homemade Oreo Cookies are also so fun to make with my kids. 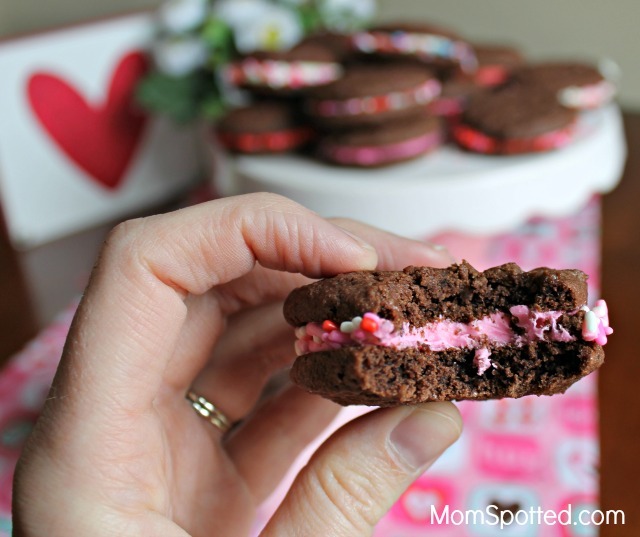 Have fun celebrating Valentine’s Day and enjoy these yummy little sandwich cookies. A soft chocolate sandwich cookie similar to an Oreo filled with vanilla or cream cheese frosting. Use food coloring to color the frosting for a festive and yummy treat. 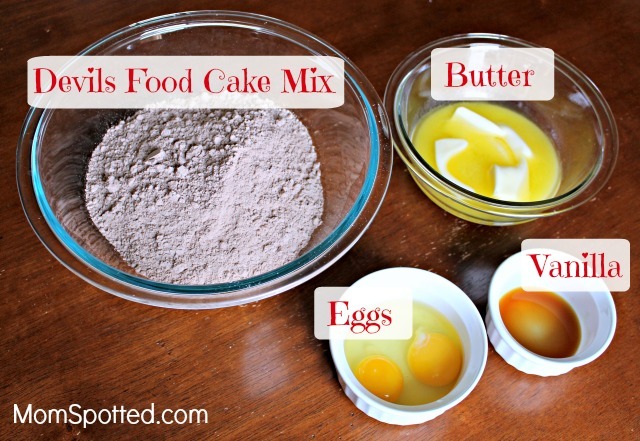 In a mixer or a large bowl combine cake mix, eggs, butter, and vanilla. Mix well until no dry spots.multiReplace" id="72" data-gr-id="72">Batter will be thick. Use a cookie scoop or measuring spoon and roll into balls. Each ball should be the same size. Put frosting into a zip lock bag and cut a corner off. Pipe frosting onto one cookie and top with a second. Assemble the rest of the cookies. These look so delicious and make such a yummy special treat! These look so good! I want to make these soon! These look too good. I wouldn’t know when to stop eating them, lol. I need to try this. I like cookies made from cake mixes. Easy peasy. 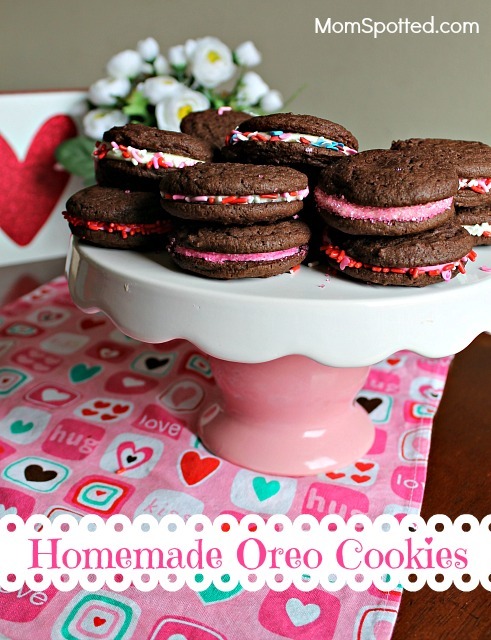 These oreo cookies look so delicious and fun to make. My daughter and I would love to make these for a dessert! Thanks for the recipe. These are almost too pretty to eat. They look bakery good! I want to try them with a tall glass of milk. They look so heavenly! The cake mix makes making cookies so foolproof. Good way to have home made cookies without too much fuss. I like how you can change the colors for different occasions. I love the way these look. I want to make them. Now these look dangerously good 🙂 I would want to eat way too many! I love the icing. I will definitely keep these in mind for next Valentines Day, we love Oreos. These sound delicious.